During the run of Justice League and Justice League Unlimited on Cartoon Network, the creators were working under something known as the "Bat-Embargo" - a mandate from Warner Brothers that Batman's villains and supporting cast couldn't be used on the show, because it would be too confusing for children watching The Batman. But apparently that street doesn't run both ways, because The Batman seems to have had no problem using its own version of the Justice League. He is Hawkman, chairman of the Justice League of America - and one of the strongest superheroes in the world. The Batman line doesn't get as much attention from the collector community as Mattel's other lines (DC Superheroes, JLU, and now DC Universe Classics) do, so it was really something of a surprise to walk into a store and see Hawkman hanging on the peg. It wasn't that I wasn't expecting the figure yet, or even the shock of seeing a non-Batman figure (like it was with Batgirl or the Joker), but the fact that this was a figure I absolutely wasn't expecting of a character I didn't know existed. Real surprise. 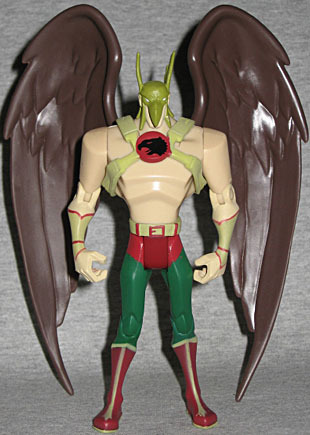 Like the JLU figures, the The Batman line has one basic body it uses for everything - Hawkman included. The frame is big and bulky, with wide shoulders, which suits him: he's always been a big bruiser, despire flitting around on little wings. His belt is a sculpted piece, but the bracers on his arms are just painted. That may seem like a cop-out, but the figure makes up for it elsewhere. Still, the plastic pins holding his knees together are the same pink as his chest, when they should be green, and that really should have been caught. Hawkman moves at the neck, shoudlers, elbows, waist, hips and knees. Hawkman (or should that be "the" Hawkman?) can always be distinguished by his weird "bird's head" helmet. Well, it has a beak, at any rate - real birds don't have a second, smaller set of wings over their ears. That does kind of ruin the illusion. The head inside the helmet looks a bit smaller than the average Bruce Wayne head from this line, but the chin is detailed well, and the mask is just the right shape - there's no question who this is supposed to be. The cartoon doesn't immediately make it clear which version of The Hawkman this is, but the back of the card clearly identifies him as The Carter Hall. Whoever he is, his 6" wings are packaged behind the figure, and plug firmly onto his back. 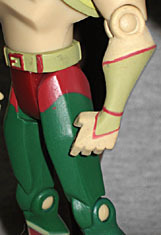 The harness is a separate piece that is also glued to the plug - a big step up from the JLU Hawkman, who just has it painted on. Since you can strip him half naked, consider The Hawkman a bit of eyecandy for the ladies! 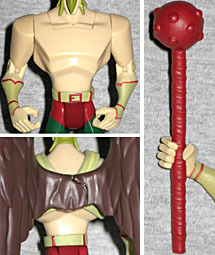 The figure also includes a lumpy red mace that matches his trunks and boots - but the plastic used for make it is so soft that it will droop in his hand if he holds it in one position for too long. That's not a problem kids will ever notice, but it's irksome for collectors. It's no surprise at all that The Hawkman is selling out the fastest in this series of The Batman figures (followed closely by fellow The JLA surprise The Green Lantern): not only is this a new character, it's a good figure. You don't have to be a fan of The Batman to like The Hawkman - the sculpt is true to the source, the wings are cool, and the attention paid to the details on this unexpected release is impressive. Just watch the mace if you're going to be displaying him for any length of time.